I’m hearing a rumour that the Liberals are going to walk out of Question Period today in protest of Stephen Harper’s reading of that Vancouver Sun article yesterday which cast a shadow on the reputation of Liberal MP Navdeep Bains. If the House cannot function as it should in a democracy, how can we get a democratic solution the important issues surrounding this debate (Air India, Anti-terrorism act)? The Grits should stay and debate. After all, I once heard that 15 minutes of time in the House of Commons costs taxpayers $75,000. UPDATE: The rumour turned out to be untrue. UPDATE: Well… not exactly. I’ve learned a bit more. The Grits were indeed going to walk out of Question Period. That is, however, until Stephen Harper came down the stairs, flanked by members of the Air India families and then scrummed with reporters (which is rare). Likely not wanting to offend the families (which would sit in the gallery during Question Period and hold a press conference at the National Press Theater to back Harper’s position on the Anti-Terrorism Act provisions) the Liberals in the opposition lobby filed into, and stayed, in the House for Question Period. Who knew that Grit could be so transparent? In the wake of the Adscam scandal, it was revealed that of all judges appointed by the Liberals — not advisory panel members, but judges themselves –nearly two-thirds had personal ties to the governing party. If one added in those from law firms with Liberal connections, the total shot up to nearly three-quarters. Yet not an official word of concern from the CBA, or the Liberals, or the Grits’ media cheerleaders about how that brought the administration of justice into disrepute. Given the left-leaning predisposition of the legal establishment in Canada over the past 30 years, it is a pretty sure bet that most of the bar association, law-society and judicial members of the advisory committees — plus many of the provincial representatives — hew to the left. Add in the Liberals’ 36 incumbent appointees, and the committees were cozy little closed shops that could be relied on to pick left-leaning ideological soulmates for the bench. Posted on February 19, 2007 Author Stephen TaylorCategories OtherTags adscam, globe and mail, judicial advisory committee, judicial appointments, macleans 50Leave a comment on Who knew that Grit could be so transparent? Stephen Harper’s famous five priorities during the previous election were packaged as such because Paul Martin seemed to name every issue as “his #1 one priority”. In fact, if I remember correctly, the Conservatives formed a list of about 100 items that Martin’s had listed as “priorities”. Of course, this labeled the last Liberal PM as “Mr. Dithers”… a leader who’d never be mistaken for a rudder. 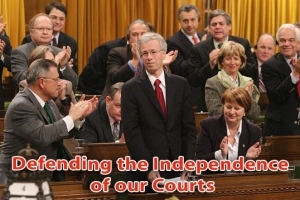 So, has Stephane Dion further refined Stephen Harper’s strategy? Will the next election campaign be based on Stephane Dion’s one priority? In fact, the Globe article comes during a week-long feature in the National Post about the Charter to coincide with a conference at McGill that focuses upon the “Charter @ 25”. Posted on February 14, 2007 Author Stephen TaylorCategories OtherTags anil pandila, annette marshall, beverly mclachlin, charter of rights and freedoms, claudette tardif, conservative party, elizabeth wilson, everett roche, fernand deveau, george cooper, gilles duceppe, globe and mail, irene lewis, james hatton, jean chretien, judicial advisory committee, karolyn m. godfrey, lawrence macaulay, lorraine hamilton, lou salley, macleans 50, marc letellier, mcgill, NDP, osgoode law, paddy torsney, paul martin, roberta hubley, rodney pacholzuk, roger yachetti, sharon appleyard, simon potter, stephane dion, university of ottawaLeave a comment on Globe and Mail causing trouble? Macleans newsmagazine has put together a new initiative called the Macleans 50 which is described as “A diverse field of Canada’s most well known and respected personalities from journalists to politicians offering their comments on the issues of the day, everyday.”. To my astonishment, Macleans editor Adam Radwanski named me to the 50 and invited me to participate and to comment at the website along with other “50s” such as Tom Flanagan, John Manley, Steve Paikin, Paul Wells, Irshad Manji, Barry Cooper, Christy Clark, and L. Ian MacDonald (among others). The “Mac 50” will comment on a variety of news from politics to health to education. The official launch was on Monday and we’ve already seen many animated discussions. I’m also happy to see Dan Arnold of CalgaryGrit on the list. I’ve been doing a bit of digging on the topic of Conservative french-language attack ads (since we all know they’re coming, and since the english-language versions were successful in English-Canada). Will they attack Dion on his dismal environmental record (since it’s a big issue in Quebec)? Will they discuss Adscam Liberals being invited back into the party-fold? I’m about 90% confident that the Tories will be making an announcement this morning detailing french-language ads to run in Quebec. UPDATE 1:02am: Upgrade to 99%. Just received word that Bernier’s running point on the presser mid-morning and that the ads will be “totally different” than the English ones (in footage of course, but in style too).